Safety Break-away couplings are used to prevent pull away accidents, protect terminal and loading/unloading equipment and eliminated unwanted product release. 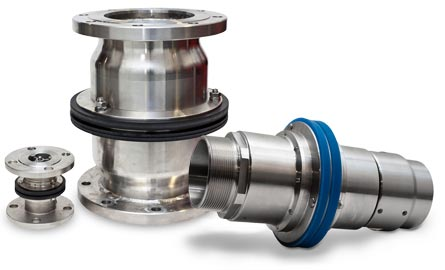 The break-away couplings has a diverted breaking point which will break at a determined break-load where upon the internal valves will automatically close on both sides. This will in a longer time frame minimize down time, save money, equipment and the environment. Breakaway couplings (also called safety breaks) are safety components. They are used during the loading processes to prevent the most serious safety hazards: The unwanted and disproportionate tensile load on the load line, caused, for example, when tankers and trains drive off too soon or by ships drifting. Such tensile loads can mechanically damage or even destroy both the connection points and the load line itself, which could even lead to uncontrolled leaks of the fluid to be loaded, resulting in the corresponding risks to people and the environment. That is why breakaway couplings are finding increasing use as the standard when loading hazardous media (caustic, toxic, explosive, etc.) in order to prevent industrial accidents. Depending on the application, widely differing technical designs are needed to reliably implement both functions. So only a specialist is able to competently select and design the suitable type, which means individual requests and advice are always necessary. That is why on these pages we are limiting ourselves to the basic disc valve technologies typically used in a wide market.